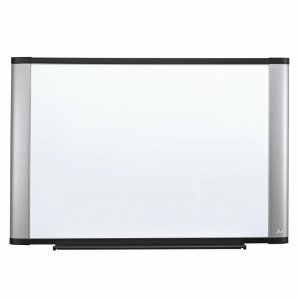 The Board Dudes Frosted Glass Dry Erase Board is a 35″ by 23″ whiteboard that is made of frosted glass in an unenclosed format. What this means is that the board extends to the full dimensions – there is no “frame”. This gives the Board Dudes white board a unique and stylish presentation. There are 4 steel bolts in the corners that are for the mounting hardware and hide the mounting from viewing while looking at the front. The full specifications can be seen here. This frosted glass whiteboard is not the largest white board that we have seen, but with the “unframed” design, it will feel and seem larger than it’s physical dimensions. This board would be perfect for an office meeting room, front office entrance to a company, or in a stylish home environment. The glass surface of this marker board means that dry erase markers will not leave marks, even if left on for long periods of time. This is important, as “ghosting” (the remnant marks left by markers on some whiteboards) is an issue that most whiteboard users try to avoid. Combining a high quality whiteboard surface with regular cleaning and maintenance will allow you to have fresh looking large whiteboards for years. One of the advantages of having this glass whiteboard is the ability to put paper behind the writing surface and use it as a template. You could print out calendars, lists, outlines, etc, and brainstorm or enumerate your thoughts without disturbing the underlying print out. This can be a huge time saver and open up many possibilities. If you are thinking about adding a larger whiteboard surface to your office or home and want a stylish and modern look, this is the whiteboard for you. 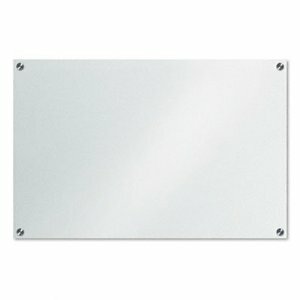 There are larger versions of these whiteboards available, glass whiteboards of up to 4′ by 8′ are generally available.